How Come Every 'How to Gain Weight' Article Looks the Same? Is it really as simple as some would have you think? You've heard the regimen if you're slender and want to gain weight: Eat six meals a day (preferably spaced not more than 2 to 3 hours apart), lift "heavy" (preferably compound exercises), do weight lifting three times a week, don't do cardio, shovel down mega calories, move as little as possible... yadda, yadda, yadda. For the slender among you: How's that working out? Are you getting big and strong? Or is the lethargy you feel from too many calories only outweighed (no pun) by the realization that your muscles are still puny while your waistline begins expansion? That's not a good road to be on; believe me - I've been there and done it. So what do you need to turn that around? Well, some good advice based on physiological distinctions might be a nice start. The advice you've been getting is so simplistic you'd think the "experts" out there are assuming you're a Neanderthal. Think about it: Eat more food... eat real often... lift real heavy... sleep a lot... make sure you don't miss workouts - then you'll "gain weight". First of all, get the notion out of your head that you need to "gain weight" and start driving it home that you need to 'build muscle'. Does this sound like just a play on semantics? Not by a long shot. The simplistic advice stating you need to take in more calories than you burn off is the recipe for fat gain. That's what fat people (I being a former one) are inadvertently doing. I don't care how skinny you are; becoming fat will not get you more dates or attention from your spouse or significant other. It won't make you more assertive. Nor will it improve athletic ability or your prowess in defending yourself when physically threatened. Those are all things that are helped by having big, strong, curvy, contoured muscles combined with a lean body. So let's contrast the process of gaining muscle with gaining fat by focusing on a pound of size you'd want to add to the possibly underdeveloped tissue of your pectorals. You know if you can just "gain weight" in your pecs, you'll be bigger. So what do you do? Why, a chest workout of course. And you make sure to use big compound movements like bench press because that's what the experts tell you will build size... and weight. You also ensure that your pecs don't get off easy - pushing yourself with intensity of effort that leaves your chest region nearly debilitated with soreness for the next couple of days. You know it's those crucial days following the workout during which growth occurs. If you've worked your pectoral muscles adequately to stimulate adaptation, the contractile tissue of the myofibrils will have been damaged. This tissue is comprised of two protein filaments; actin and myosin. When you allow those filaments to fully recuperate from the damage, they develop compensatory tissue that's similar to scar tissue on a skin injury. If you work those muscles any time prior to that compensatory protein tissue being constructed, it's somewhat like picking scab tissue off a skin wound. And just as picking a scab off a wound will set back its healing, so will working a muscle any time prior to its full and 'adaptation-inclusive' recuperation. This is the counter-productive scenario that's most often the cause of bodybuilding plateaus. The full recuperation of your pecs will take a specific amount of time, calories, and bodily energy. The amount depends on how much damage was done. Yes, it requires a hefty supply of protein and a few calories above your non-bodybuilding maintenance levels. However, it will not take place any faster just because you stuffed down a thousand extra calories today if all your body needed was a hundred additional calories for repair material and energy. In fact, processing excess calories can be an enervating task for your body - potentially robbing it of the vital energy it needs for myofibril repair. Can anyone say "food coma"? But what does the "bulk-up" crowd recommend you do? First of all, they tell you that you need to "gain weight" instead of 'build muscle'. Then they tell you that there are about 3500 calories in a pound of "body weight". Then they tell you to take in 500 calories a day above your maintenance levels so you can put on a pound a week. And if you end up not putting on this weight, they usually say it's because you're not eating enough. Exactly what kind of "weight" are we talking about here? Imagine that slab of pectoral muscle you're trying to add. You've blasted your chest on Monday and you're planning to hit it again on Friday. When Friday rolls around, you unknowingly go to the gym with "myofibril scab tissue" rather than fully recuperated and adapted pectoral muscles. You hit your chest with another workout because you feel fully secure with the fact that you're eating your prescribed 500 or 1000 extra calories per day. But your broken down muscle tissue will still only grab what calories it needs for the methodical process of recuperation. It doesn't move faster with the process just because there are extra calories present. Now you've just set your chest muscle recuperation farther backwards and your body has all the joy of processing a bunch of calories that were possibly unneeded. And what if those extra calories get deposited as fat? Well, then the "bulk-up experts" will tell you that you've gained adipose weight that was necessary for putting on the muscle weight. 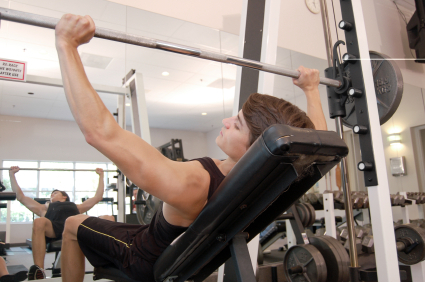 However, if your pectoral recuperation keeps going in the wrong direction, you won't gain much muscle weight - if any. You will have succeeded at "gaining weight", but it will be the kind that causes your chest to bounce when you run toward a closing elevator door or a departure gate at the airport. Anyone who sees my 'before picture' on my website can witness the kind of chest weight to which I'm referring. So how come every 'how to gain weight' article looks the same? I'm not sure. But I can guarantee you that this one is different than most.